Tomlinson seems the perfect person to turn tradition on its head: A self-taught metalworker, he admits he’s crazy enough to try anything. Known around Asheville as a musician with his self-described “amphetamine folk” band, David Earl and the Plowshares, and a commercial sign maker, Tomlinson began creating art “semi-accidentally,” he says. He spent five years in the Marines, serving in Saudi Arabia during Desert Storm, lived and worked on a Madison County farm for more than a year, and served as a stagehand at the former Asheville Civic Center, setting up and breaking down traveling shows. Serendipitously, the last job led to an opportunity with designer and renovator Doug Madaras. He joined Madaras’s team as a fabricator, helping create custom fixtures inside Zambra Wine & Tapas and the signature embedded-light counter at Doc Chey’s Noodle House, among other high-profile projects. When Madaras relocated in 2004, Tomlinson struck out on his own with Dynamic Metalwork, creating a niche for himself with the traffic-stopping signs he’s made for some of Asheville’s most recognizable businesses, including Salsa’s, Minx, Clingman Café, Mayfel’s, Boca, and Over Easy Café. The small, scrap-metal samples he made to show potential clients left him with a stash of squares just begging to be reused and transformed. With a River Arts District Studio Stroll coming up, Tomlinson (who then rented space in the area), seized on the idea of making a scrap metal quilt to display. It sold the first day of the event and commissions followed. Southern Living magazine featured one of the quilts in 2008. 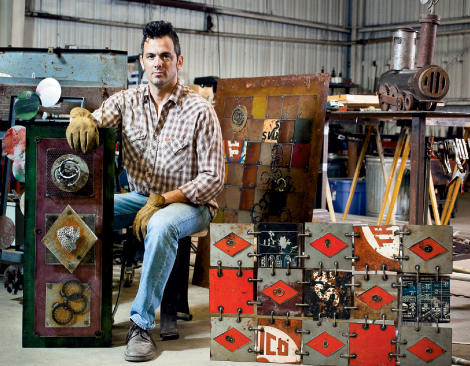 Now sharing space with other metal artists in a hangar-size West Asheville warehouse nicknamed “The Fanger,” Tomlinson scours local scrap yards for interesting castoffs with surface texture and color. “I enjoy finding what I can and letting the work take its course,” he says. He shapes the squares using a plasma cutter, arranges them in contrasting patterns, and “stitches” them together with rivets or metal pins, creating wall hangings roughly six feet wide by four feet tall. Recently, he’s begun making furniture, including an aluminum couch and steel liquor cabinet. “The material is inert, but the process is dynamic,” he says. With so many more little scraps of inspiration out there just waiting to be transformed, it makes you wonder what he’ll create next.